See how visitors move through your site with this visual report. 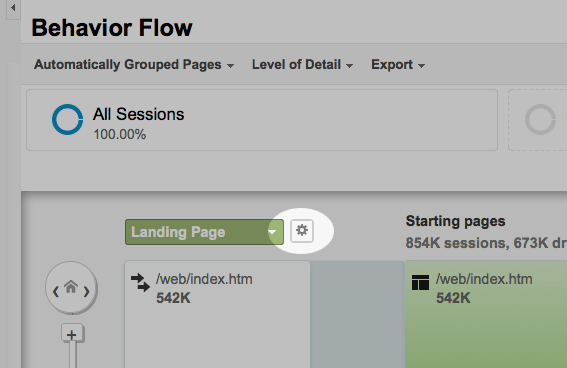 Behavior Flow shows you what pages are visited first, second, third, etc. by your visitors, not just how many visits each page gets. This allows you to see how a visitor explores your site and how they are actively finding your information. This report can show you whether your impressions of how visitors move through your site is accurate or not. For example, if a page you think has the most important information on it being reported as your visitors' 4th page to visit, you can use this data to help you rearrange your site to make that page more easy to find. How do you find this report? You can find it by clicking through Behavior > Behavior Flow. 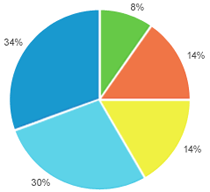 This report automatically defaults to display customized information for Future Students. Be sure to make the proper adjustments (steps 3-4 below) to be able to view data for all other web areas. How do I find data specific to my site? Click 'Apply' and you're good-to-go.